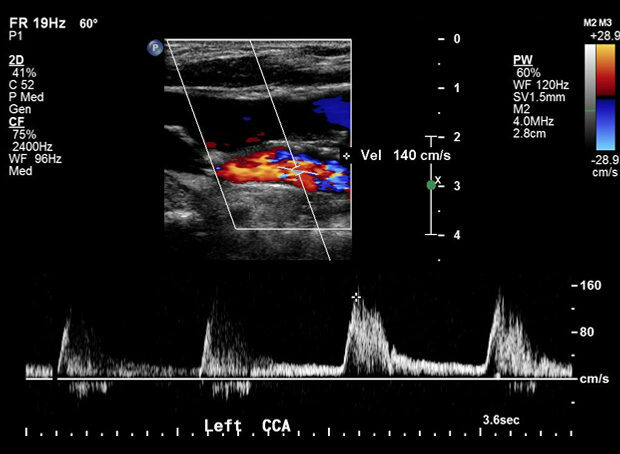 Lower Extremity Pressures and Waves, with limited bilateral subclavian and vertebral artery duplex added by the sonographer based on exam findings. This course is designed to provide an introduction into the ultrasound evaluation of the cerebrovascular system, lower extremity arterial system and lower extremity venous system. 2 years s/p left common femoral artery endarterectomy. Previous ABIs 1.2R and 1.6L. Protocol consists of obtaining PVR waveforms at the upper and lower thighs, calves, and ankles. 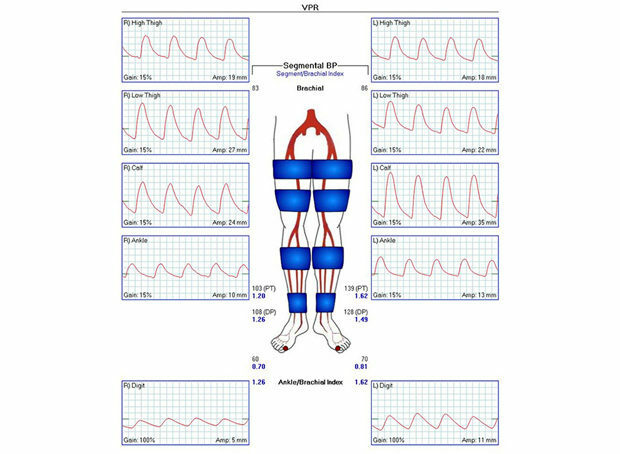 Blood pressures are obtained from bilateral brachial, dorsalis pedis, and posterior tibial arteries using a CW Doppler pencil probe. 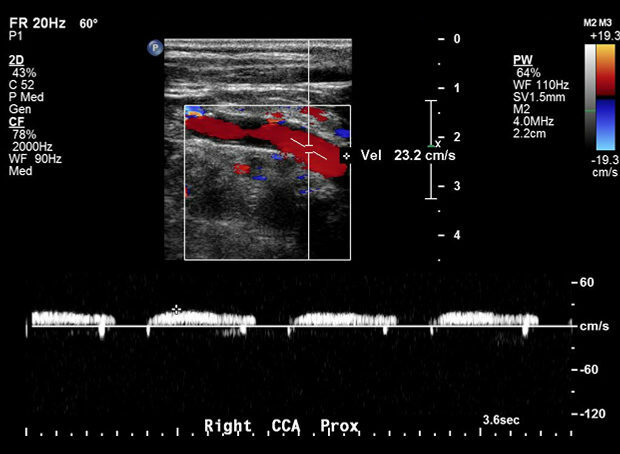 Ankle/brachial indices of 1.26 and 1.62 were calculated on the right and left, respectively. Great toe pressures and PPG waveforms were added based on left ankle/brachial index greater than 1.3. Toe/brachial indices measured 0.70 on the right and 0.81 on the left. While auscultating Doppler signals at the wrists for blood pressure measurement, the sonographer noted that the Doppler signals were audibly monophasic. Brachial pressures measured 83 mm Hg on the right and 86 mm Hg on the left. 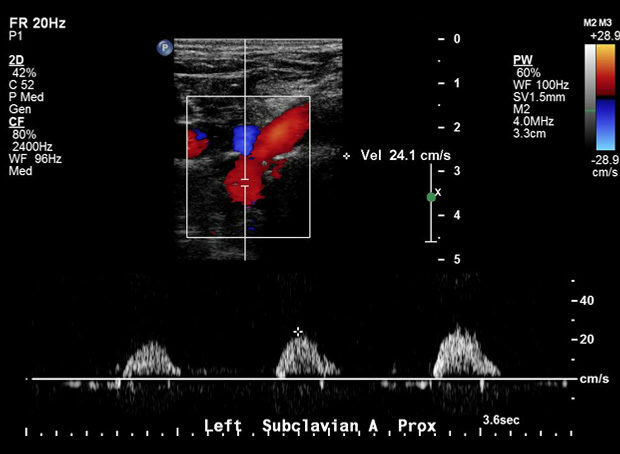 Because of the low arm pressures and monophasic Doppler signals, the sonographer decided to check the subclavian arteries using duplex ultrasound. On the right, innominate, proximal to mid subclavian, and vertebral artery flow was retrograde. Distal subclavian artery flow was antegrade, with a collateral vessel noted at the mid to distal subclavian artery. Common carotid artery flow was very low and monophasic. Findings suggest significant proximal innominate artery obstruction. 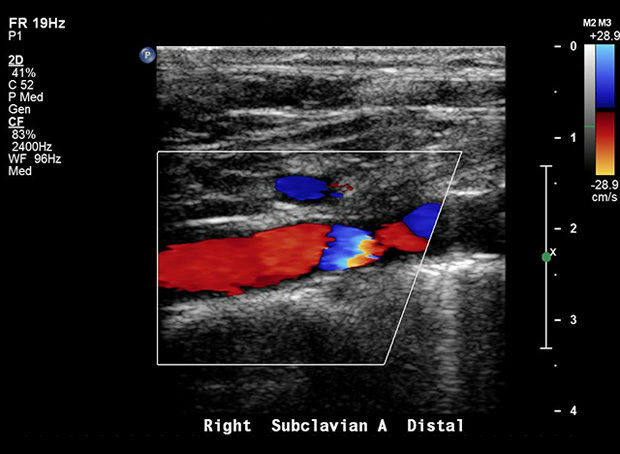 On the left, subclavian and vertebral artery flow was antegrade but monophasic. Common carotid artery flow was essentially normal. Findings suggest proximal left subclavian artery obstruction. Don’t be afraid to expand the protocol if something does not seem right. This was missed on previous follow-ups because the ABIs and TBIs were “normal,” and the patient never complained of any upper extremity or cerebrovascular symptoms until prompted. Patient referred back for Upper Extremity Pressures and Waves, as well as a full Carotid Duplex. Wrist/brachial indices were normal bilaterally, however are unreliable due to known bilateral obstruction. PVR waveforms were abnormal bilaterally with no dicrotic notch identified.